Indian actress who starred in a variety of Movies, including Thambi Oorukku Pudhusa in 1991 and Deiva Vaaku in 1992. She was born on 30th November 1974 in Chennai, Tamil Nadu. Who is working in Tamil film and television industry. Yuvarani started her career in Kollywood starring as a Tamil Film Actress in “Azhagan” (1991) along with Mammootty, directed by K.Balachander and produced by Kovai Chezhiyan. She also acted with popular actors like Sathyaraj, Vijay, Bharath, Madhavan and Vimal. She has appeared in some well known films such as Walter Vetrivel, Sendhoorapandi, Chinna Madam, Parthale Paravasam and Singam. Her performances in many films were lauded especially in “Baashha” which was one of the Best films of the year 1995. Yuvarani was noted for roles in films like “Singam II” along with Surya, Anushka Shetty, Hansika Motwani and Vivek. Yuvarani currently doing the negative role in Poove Poochudava serial along with Dinesh Gopalsamy in Zee Tamil, Bharya serial along with Rajendran in Asianet and Ponnukku Thanga Manasu serial along with Tejaswini Shekar in Vijay TV. Yuvarani as Rajeshwari role in Lakshmi Kalyanam serial. Yuvarani as Shiva’s mother role in Ganga serial. 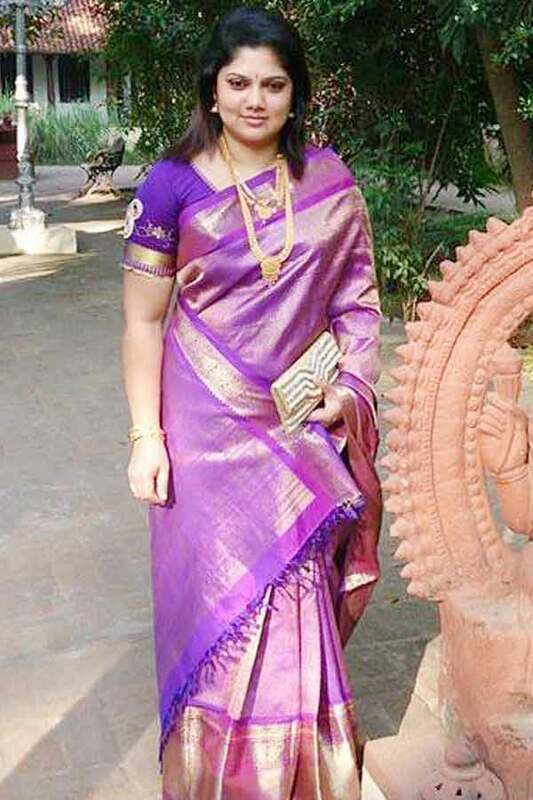 Yuvarani as Jayaprabha Teacher role in Bharya serial. Yuvarani as Subatra role in Poove Poochudava serial. Chithi, Agni pravesham, Suryavamsam, Senthurapoove, Kalyanam, Thendral, Mamiyar Thevai, Uravugal Sangamam, Mannan Magal, Bharya, Pasamalar, Ponnukku Thanga Manasu, Ganga, Lakshmi Kalyanam, Poove Poochudava. Azhagan, Thambi Oorukku Pudhusa, Deiva Vaaku, Pudhu Varusham, Jathi Malli, Walter Vetrivel, Minimini Poochigal, Kathirukka Neramillai, Sendhoorapandi, Chinna Madam, Nila, Veeramani, Baashha, Pasumpon, Chellakannu, Thirumbi Paar, Maapillai Manasu Poopola, Sakthi, Adutha Kattam, Parthale Paravasam, Ice, Silambattam, Jaganmohini, Thambikku Indha Ooru, Singam, Indrasena, Gowravargal, Sura, Aadu Puli, Ishtam, 18 Vayasu, Mirattal, Singam 2, Jannal Oram, Iravum Pagalum Varum, Kalai Vendhan, Varusa Naadu, Singam 3, Summave Aaduvom, Kadaikutty Singam.